In a previous article on Storage Two, I talked about our summer science film series: Science on the Silver Screen. This summer, we watched four different sci-fi movies, whose titles coincidentally all begin with vowels: Arrival, Artificial Intelligence, Inception, and Alien (see article on Alien here). Science on the Silver screen brought a much-needed dose of scrutiny to science in movies. Most films aim to entertain, not educate, and the science they portray is rarely without bias. To tackle this bias head on, a scientific expert sat in on each film and led wide-ranging discussions on science fact vs fiction after the credits rolled. While there’s nothing wrong with enjoying even the most fantastical of bogus science in movies (I’m a big fan of monster and disaster movies myself), it’s important to keep scientific opinions based in the real world. Our expert guide to this process for the film Inception was Dr. Blair Hoplight. Dr. Hoplight is an assistant professor at the New York Institute of Technology where he conducts research in behavioral neuroscience and genetics. His research interests touch on many subjects, including memory, creativity, and unconscious behaviors. Both an accomplished teacher and scientist, Dr. Hoplight was the perfect expert to give us a scientific analysis of Inception. As it turned out, not only was Dr. Hoplight well versed on the science of Inception, he is an adept practitioner of inception as well. On an unrelated note, look at this jar of jellybeans. Do you think the number of jellybeans is higher or lower than 500? Think of a jellybean estimate and try to remember it for later. There are a number of scenes that take place in the real world in Inception, but the second half of the movie is almost entirely within the land of dreams. Using specialized drugs and equipment, characters are able to maintain self-awareness even while in a dream state. The dreams they explore are highly detailed and realistic, generally indistinguishable from the real world. What’s more, characters can enter the dreams of others to steal secrets from their subconscious. So, what is a dream anyways? Can we really experience the dreams of others? In his discussion, Dr. Hoplight made it clear that he was discussing the neuroscience of dreams, not the psychology or symbolism. In neuroscience, sleep is split into two main categories: REM (random eye movement) and non-REM sleep. These stages are part of a broader cycle of sleep, which repeats around 4 – 6 times per night. The first portion of the cycle is non-REM sleep, further broken up into three stages. In the first stage of sleep, you are still drifting in and out of sleep and are very easy to wake. Your muscles are relaxing, but may suddenly contract and give you a sudden sensation of falling. This lasts for 5-10 minutes. During stage two of non-REM sleep, you are lightly sleeping. Your body temperature drops and the pace of your heartbeat slows. Your body is getting ready for deep sleep. Stage three is when deep sleep occurs. It’s harder to wake up in this stage, and you may be groggy and disoriented if you do. Deep sleep is very important and a lot of tissue repair and other body maintenance occurs during this stage. Deep sleep is when sleepwalking and night terrors may occur. This cat is experiencing REM sleep with his eyes partially open. He wakes up hissing. Did he have a nightmare? The non-REM cycle usually lasts around 90 minutes. After it is complete, REM sleep occurs. Your eyes begin to move around behind your closed eyelids, the rapid eye movement this stage is named for. Both your body and brain become more active during REM sleep, with breathing and heart rate both speeding up. Though dreams can occur at any stage of sleep, most occur during REM sleep. A period of REM sleep can last anywhere from 10 minutes to an hour, typically increasing in duration throughout the night. People tend to wake up naturally at the end of REM sleep and are more alert than if they wake up during different stages. If you always feel groggy in the morning, your alarm clock may be waking you up at the wrong point in your sleep cycle (apps have been developed to wake you up at the right point in your sleep cycle). In a neurobiological sense, dreams are very interesting. As mentioned in Inception, most dreamers aren’t aware that they’re asleep, even if they are riding a giraffe into battle against a zombie hoard. This may be because there is decreased activity in the prefrontal cortex during dreaming. This part of the brain plays a large role in logic and planning, so its inactivity may result in the dreamer’s unquestioning acceptance of whatever bizarre scenarios their dreams throw at them. 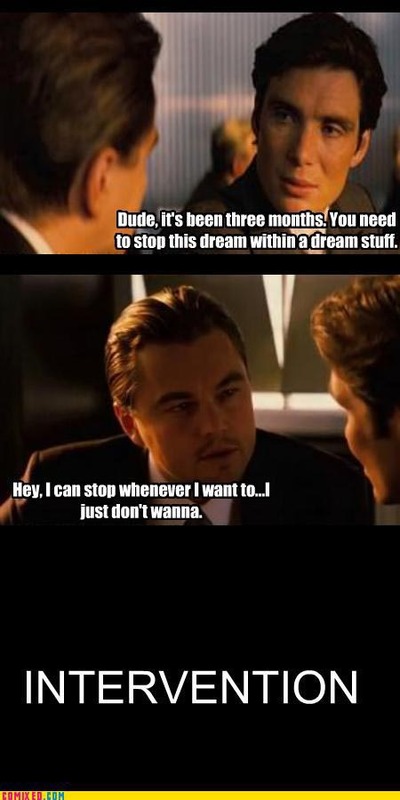 Inception is also somewhat infamous for inspiring memes. Though scientists may have understanding of what is happening in your brain when you dream, the reason why we dream is much more poorly understood. Researchers have put forth many suggestions about the reason for dreaming but there isn’t enough evidence to support any one viewpoint. Some scientists think that dreams might be the brain’s way of strengthening or processing memories. Others suggest that dreams might play a role in emotional adaptation or mood regulation. Evolutionary biologists have proposed that dreams might be a way of rehearsing threatening events to better survive them when they occur in real life, but none of these concepts are any more valid than the other. For now, science has no answers as to why we dream. As for whether it is possible for a group of people to go wandering around in dreams, Dr. Hoplight was very clear on this front: No, it isn’t. After we discussed dreams and the science of sleep, we got into inception. In the film, inception is the processes by which someone can implant an external idea into someone’s subconscious through infiltrating their dreams. While the dream part of inception might be bogus, the idea that people can implant ideas into another’s subconscious is surprisingly viable. To drive this point home, Dr. Hoplight performed waking inception on the entire audience. Even I, who knew what to expect, still had an idea implanted into my mind. Are you skeptical? Believe it or not, I’ve already performed waking inception on you during the time you’ve been reading this article. Remember the jellybeans? Try to remember how many you thought were in the jar. No matter what number you chose, it’s probably closer to 500 than it would have been if I hadn’t asked mentioned a number first. This is a psychological concept known as anchoring. The concept of anchoring was first studied in the 1970s. The psychologists Tversky and Kahneman had the suspicion that they could influence a subject’s estimation of the number of objects if they suggested a number to the subject first. They researched this concept using a single question as a base: What percentage of African nations are members of the United Nations? They primed half the participants with the number 65. The group of primed subjects answered on average that 45% of African nations were UN members. However, when they primed subjects with the number 10 instead, the response dropped to an estimate of 25%. Dr. Hoplight performed a very similar experiment on the audience with a jar of jellybeans. He gave half of the room slips of paper asking if they thought the number of jellybeans was higher or lower than 700, and then asked them to guess how many they thought there were. With the other half of the room, he suggested 900 instead. True to form, the people primed with higher numbers tended to suggest higher numbers of jellybeans. Clearly I just need a better totem. After the event I asked him what the true jellybean count was. He didn’t have an exact number, but knew it was somewhere in the 700-900 range. This higher number initially stunned me, but then I realized that I had been primed with the numbers 200 and 300, just like the audience members had been primed with 700 and 900. My guess for jellybeans was close to the numbers I was primed with, despite me knowing about the trick ahead of time. Science assures me that this is a common condition. Even if you are aware of anchoring as a concept, you can still very easily fall prey to it. So where might you encounter anchoring in life? It is a common sales tactic used in negotiation, from car salespeople to salary negotiators. If a used car salesperson suggests a price to you, psychology suggests that your bargaining will be anchored by that number. Keep this trick in mind before you make a big purchase, or even a small one at a yard sale. Anchoring isn’t the only mental trick that can be used to perform waking inception on a subject. The misinformation effect is another sneaky way your subconscious can be invaded. Memories are much more mutable than many realize, and the misinformation effect describes how incorrect information can be inserted into an existing memory. This memory altering can occur innocently as a part of life, but it also can be wielded for much more deliberate and selfish purposes. As people usually aren’t aware that their memories have been altered, this quirk of the human psyche can have very serious consequences. There are a number of experiments that have demonstrated the misinformation effect and how easily it can be applied. One such experiment involved the video of a car crash, seen below. To test your perception, watch the video and try to guess how fast the vehicles were going when they contacted each other. During the course of the experiment, subjects watched the film and answered a single question after: “How fast were the vehicles going when they______?” The final word of the question would vary between participants, to test whether word choice can impact perception and memory. The possible words that filled the blank were: Contacted, hit, bumped, collided, and smashed. These words are similar, but express different levels of intensity. When people estimated the speed of the cars, people primed more intense words tended to respond with higher speeds. The average speeds estimated for each word are as follows: Smashed: 40.8 mph, collided: 39.3 mph, bumped: 38.1 mph, hit: 34.0 mph, contacted: 31.8 mph. Remember that these are averages, so responses varied higher and lower than these numbers. So what was your guess for how fast the cars were going? You were primed with “contacted,” so this experiment would suggest that you gave an answer on the slower end of the spectrum. The misinformation effect version of inception is especially troubling. Lawyers often use the misinformation effect to their benefit during court proceedings. If they ask for witness testimony on the speed of two cars involved in a wreck, they can use word choice to subconsciously influence the answers they’ll get. This is one reason why eye witness testimony is so notoriously unreliable. A lot of repressed memory panics involved fears of Satanic cults abusing children. So-called “repressed memories” are another big trap of the misinformation effect. In the 90s, the idea of repressed memories really took off. It was commonly believed that if a person (or especially, a child) experienced a traumatic event, the memory of that event might become severely repressed, only able to be unlocked by a skilled psychotherapist. In response to these beliefs, court cases exploded where a victim who recently “remembered” childhood trauma confronted the people they thought had abused them. Unfortunately, it’s entirely likely that many of these “victims” were actually victims of something else: The misinformation effect. It’s been shown in studies that very vivid memories can be artificially implanted in the minds of both adults and children during therapy sessions, and that neither adults nor children can discern between these false memories and real ones. However, it is important to acknowledge that most psychotherapists of the time were not attempting anything nefarious during their sessions. The false memory implantations were entirely accidental, the result of strong suggestions mixed with incorrect science. As it turns out, therapeutic procedure for recovering a "repressed memory" is very similar to the process of implanting a false one. The more research is done on the subject, the more permeable thought and memory seem. The misinformation effect and anchoring are two methods that could be used to implant outside ideas into someone’s mind, and there are undoubtedly many more. What Inception got wrong isn’t the possibility of inception itself, it’s the idea that inception would be difficult to perform. As it turns out, you don’t need fancy equipment to make someone think a thought other than their own. Sometimes you just need a suggestion.